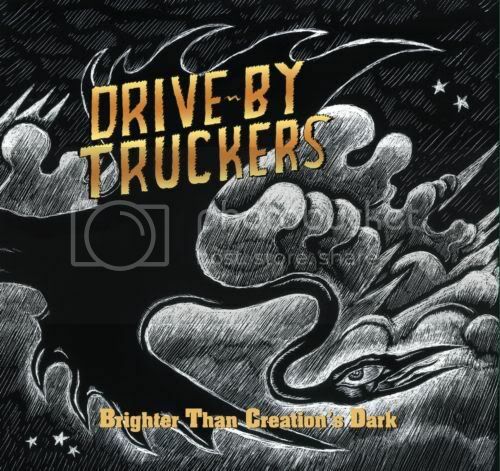 The Drive-By Truckers: "Brighter Than Creation's Dark"
The songwriting well of the Drive-By Truckers never really seems to run dry. They've now released 10 studio albums and you get the feeling they've got two or three more in the chamber at any point. I suppose it helps when you have two (and at times, three) primary songwriters contributing to the mix. And not only do they put out a lot of albums, they put out alot of long albums. Most of them register at least 14 songs, topping out at 20 with the much-celebrated double LP Southern Rock Opera. But their ninth album, Brighter Than Creation's Dark, was only one shy of that tally. This was the result of Patterson Hood's desire to create 4 movements, if you will, one represented by each side of the double-vinyl. If you know the songs, you can probably guess where one movement ends and the next begins. However, the album was crammed into a single CD, which means there aren't any intermissions or delays; just one song to the next, 19 times. So while I wouldn't want to compromise Patterson's vision (nor that of any artist whose album I've covered in this feature), I can at least take a stab at creating one abbreviated version of the record that can be enjoyed continuously outside of its 4-sided context. A version that sheds some of the conceptual turns and wandering tracks, and leaves us with one meaty Truckers album. "Two Daughters and a Beautiful Wife" - Nice tonesetter here about the tragic murder of indie musician Bryan Harvey. "3 Dimes Down" - Here's where I differ from the DBT core. I like Mike Cooley songs, I do, but he can be extremely formulaic. For example, Three of his songs on this album adhere to an almost identical chord structure. This would be the only one of the three I'd hang on to. "The Righteous Path" - One of my favorites here. Patterson really delivers on this album. "I'm Sorry Huston" - This is the best song Shonna's written for the Truckers, by a mile. "Perfect Timing" - A solid Mike Cooley entry. "Daddy Needs a Drink" - Another Patterson keeper, its calm domesticity is a nice complement to some of the bruisers Patterson unleashes on BTCD. "Self Destructive Zones" - The next two Cooley tracks are anything but essential. "Bob" - A track about a closeted homosexual living in redneck America, I could never get past the silly musical feel of the song as a whole. "Home Field Advantage" - Shonna fouls out on this one. "Opening Act" - I was on the fence here, but at nearly seven minutes, it lingers a bit too long for an already-expansive album. "Lisa's Birthday" - Just love this tune; it's Cooley doing his best Dwight Yoakum. "The Man I Shot" - Hood's most gutpunching effort since "Sinkhole", and a definite keeper. "Purgatory Line" - It's not a bad song, but I cringe hard when Shonna sings "I love you like the dickens". Gotta lose it. "The Home Front" - Absolutely love "The Home Front", and in losing "Purgatory Line", it makes the perfect come-down from the shellshock of "The Man I Shot". "Checkout Time in Vegas" - What would a DBT's album be without a Cooley-penned ballad? "You and Your Crystal Meth" - It's a bit of an overstated message for the album; I think Patterson could have saved this one for Murdering Oscar. "Goode's Field Road" - A nice dirty Southern gothic creeper, it's a hearty late-album story song that the DBTs do so well. "A Ghost to Most" - Just as every DBT's album needs a Cooley-penned ballad, it also needs a Cooley-penned upbeat anthem ("Zip City", "Marry Me", etc.) Add this one to the list. "Monument Valley" - No problem with the album-closer, which ends just when you think a slow-dance is about to break out. "Two Daughters and a Beautiful Wife"
My diagnosis? Brighter Than Creations Dark could--like all of us, really--stand to lose a bit around the midsection. Perhaps it's the natural inclination of the listener to focus more on either end of a particularly sprawling album. Whatever the case may be, I feel that Brighter Than Creation's Dark starts strong, but strays a bit before ending nicely. Still, don't feel like I'm shortchanging the Alabamian asswhoopers, because whats left is a 14-song run even after my edits. But I stand by my assertion that we really don't need three Cooley with identical chord-structures, nor do we need two mehxcellent Shonna Tucker contributions. I would like to reiterate that her song "I'm Sorry Huston" might be one of the best songs from any of the Truckers last three LPs, and she deserves a ton of credit for her songwriting chops.